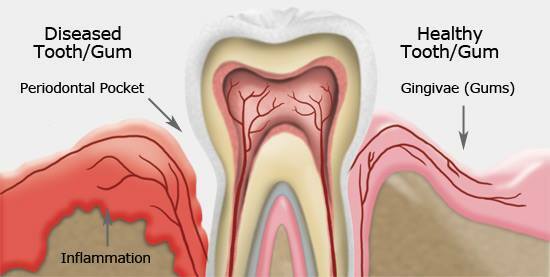 Periodontal disease (gum disease) is categorized by a progressive loss of gum tissue and jaw bone. It is the number one cause of tooth loss among adults. Periodontal disease occurs when bacterial toxic waste irritates and inflames the soft tissues surrounding the teeth. If left untreated, erosion of the gum tissue and jaw bone leads to loose, shifting or complete tooth loss. However, the mouth is not independent of the rest of the body. The bacteria, toxins, inflammation and immune system response can help cause and make worse medical conditions. Patients are often confused when they find out they have periodontal disease. The disease process does not hurt until severe damage has been done. It is extremely common to have some level of gum disease. It’s our intention to give our patients knowledge and education so that they can make informed decisions about their dental health. A great source of information is our Periodontal Disease videos. Click on the following links for more information about periodontal disease. 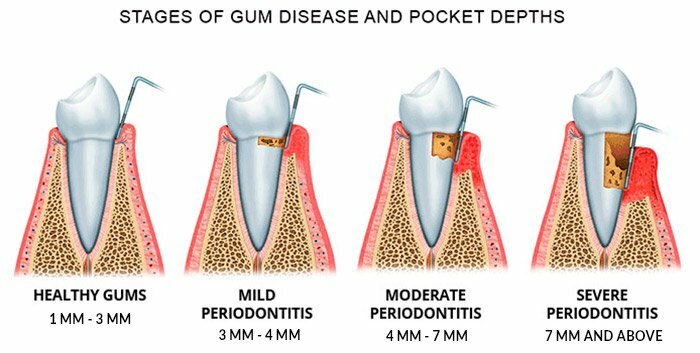 What is Gum / Periodontal Disease? Gum tissue naturally attaches to your teeth about 2 to 3mm below the visible gum line. Gingivitis can exist under the gum line , but there will be no gum detachment from the tooth and no loss of ligament or supporting bone. Periodontal Disease starts when the gums start to detach from the teeth, forming pockets, and the ligaments and bone start to dissolve away. Periodontal disease advances from mild to moderate to severe. Dr. Nugent or his hygienists use a small probe (ruler) to measure the depth of gum pockets and can see the extent of bone loss in X-ray images. The gum pocket depth below the gum line is between 3mm and 4mm and there is some ligament and bone loss around the tooth. Measured gum pocket depth is between 4mm and 7mm and the ligament and bone loss has advanced. Gum pocket depth is now 7mm or greater and the ligament and bone loss is extensive. Tooth roots are only 10 to 12 mm deep and when the pocket depth is advanced well beyond 7mm the tooth is in severe danger. Teeth can become loose at this point and may have to be extracted. If you notice any of these you should call our office for a full examination as these are all symptoms of gum disease.